This is my new Gazelle Arroyo C8 electric pedal-assist bike. Her name is Gudrun. Her battery is hidden under the rear rack. Her almost-silent electric motor is between the pedals. There are four power levels: Eco, Tour, Sport, and Turbo. At the bottom of a hill that you wouldn't dream of riding up on a heavy Dutch bike like my Eleanor, you set the motor to turbo, shift down to the lowest gear, and that's when it's like wearing ten-league boots in a dream. You have to pedal, but you're like Wonder Woman when you do. It's true that you don't get as much exercise on an ebike. I rode Gudrun home across town this afternoon without breaking a sweat, and I want to break a sweat sometimes. That's why I'm keeping Eleanor. But with Gudrun, I'll be able to do a 20-mile round trip, or pull a trailer of bark dust, or go to the inexpensive acupuncture clinic at the top of the hill--all things that have gradually but inexorably slipped from my grasp in the last three years. My sister tried Gudrun out this afternoon, and halfway up the street I heard her shout, "This is AWESOME!" *The wonderful lyr, with whom I had a delightful lunch and conversation today, and who is a namer of things, suggested "Gudrun" based on a photograph, and she was right. I obviously come from a country of cyclists - in Copenhagen an estimated 700,000 people commute by bike, and the Crown Prince is occasionally seen biking a few of his kids to school... So I have to love anything that allows people to ride a bike even when they can perhaps not QUITE do it unassisted. It still gives more exercise than sitting in a car or on a bus. 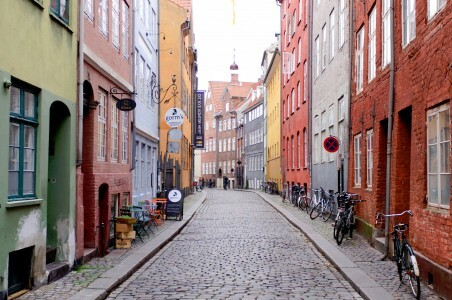 I can't tell you how many videos of cycling in Copenhagen I've enviously watched! I would love to visit and try it for myself. I practice essentially that style of cycling here (though we don't get as much snow and we don't have safe, separated cycle tracks), and little by little over the years, I've seen more Portlanders adopting it: an upright bike, street clothes, relaxed pedaling, all weather. After almost eight years of riding my Omafiets--which I only started doing at age 54--I've found my orbit slowly shrinking. Hills were becoming bigger obstacles, and anything more than about five miles away was beginning to feel out of reach. With Gudrun, I can double my range, and probably keep riding for many more years. I expect that I'll keep riding my Oma in the flats and for my everyday errands--she's still a workhorse. But on Gudrun I can get out to the 'burbs to visit friends and family and those giant stores. We don't really get much snow in Denmark - we have perhaps 2-3 weeks in total with snow on the ground (often just 1-2 days at a time before it melts again) and it's often no more than an inch or so, especially in Copenhagen where the heat from buildings make the microclimate somewhat warmer. But yes, the bike lanes make all the difference, and in recent years they've launched a project of "bicycle highways" in Copenhagen. Basically it's regular bike lanes, but on stretches where traffic lights are timed to the average biking spreed to provide "green waves" of traffic lights for bikes, not for cars, and on top of this there are stations with automatic bike pumps like the ones for cars you find at gas stations. But ebikes can do something special, and I love that they exist for when I'll need - or just want - one. Imagine! Timing the lights for bike speeds. That sounds wonderful. We have that in our downtown area, but you're riding with the cars, so it's no fun at all. Have you seen the Netherlands' Hovenring? Amazing. Oh! The Snake! Yes, that comes up on the bike-blogosphere. It looks wonderful to ride. I hadn't heard of Superkilen. It looks awesome in this aerial shot. 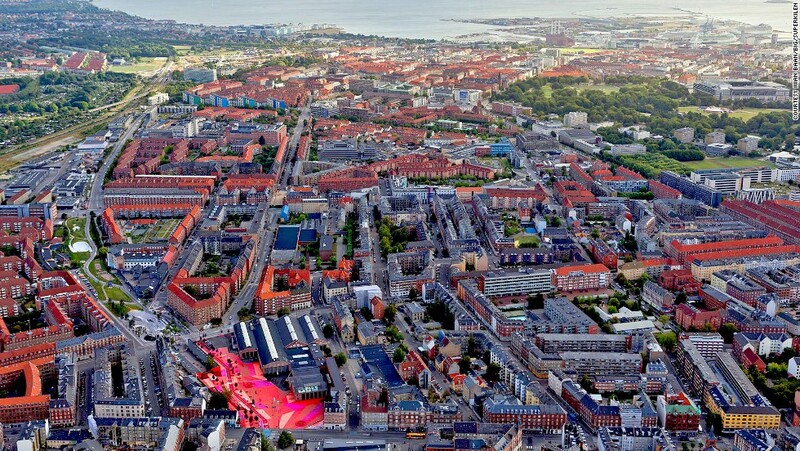 I must say, from above, Copenhagen is quite colorful in general. It sounds like a hot mess when you describe it, but it sort of comes together and looks coherent. It's beautiful! And look at all the lovely bikes! That looks absolutely AMAZING. Go you! !